. . .a blog about photography and occasional random things. This sweetheart is Missy, who is available for adoption from the Humane Society of Noble County. She is a long-haired female who is up-to-date on all vaccinations. She is gray with a white chest, 4 white feet, and a white stripe on her nose. Missy is approximately 1 year old and has been at the shelter for about a week. She is very friendly and likes to be petted. She is also curious and likes to explore. Her gorgeous long fur is very soft, and just look at that fluffy tail! 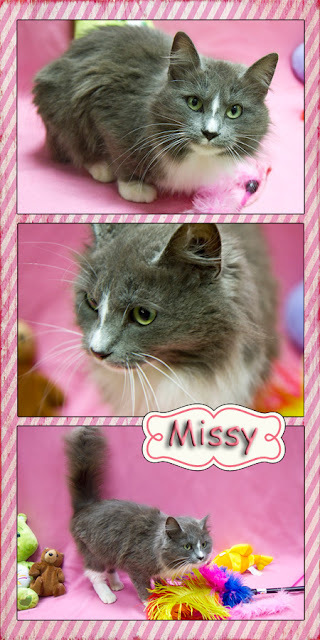 Come visit Missy and see if you could give her the loving, forever home that she is waiting for! Black Jack and Zion are two special boys who are available for adoption from the Humane Society of Noble County. They are both neutered, up-to-date on vaccinations, and have been microchipped. What makes them special is that they are FIV-positive. About the only way they can spread this virus to other cats is by biting them, but some people feel that FIV-positives need to be the only cats in the family. They generally lead pretty normal lives even though they carry this virus. 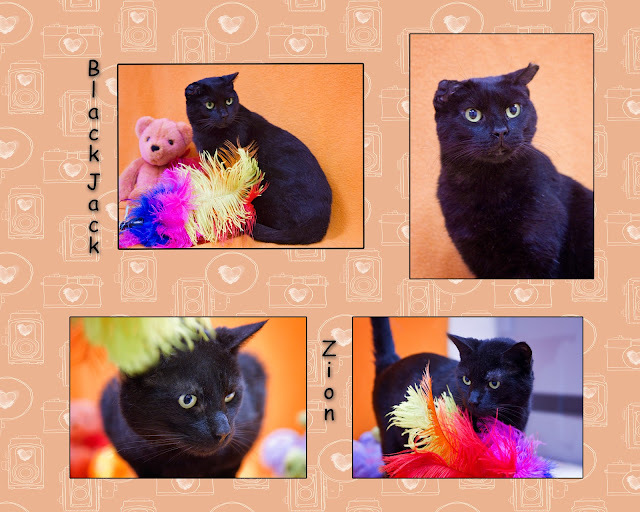 Both Black Jack and Zion are 6-7 years old and have been at the shelter for about a month. These boys are short-haired black cats, and Black Jack has a deformed ear, which gives him sort of a cute, goofy look. They are both friendly and love attention! They purr loudly when petted and brushed and are very well-behaved! 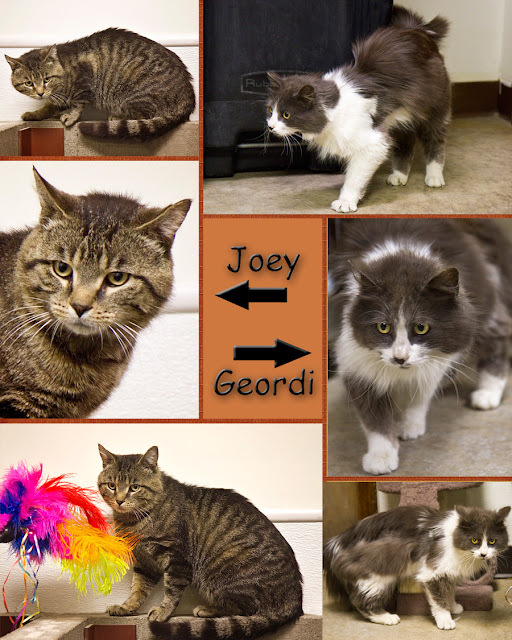 These two have been together for most of their lives, and it would be ideal if they could be adopted together. They are often found cuddling together in a hammock in their cage! They have a lot of love to give and hope to find a special forever home where they can receive the love that they deserve. Please come see if you could be the special person they need! This is beautiful Mulan, who is available for adoption at the Humane Society of Noble County. She is up-to-date on shots, worming, and flea prevention, is FIV-negative, and has been spayed. 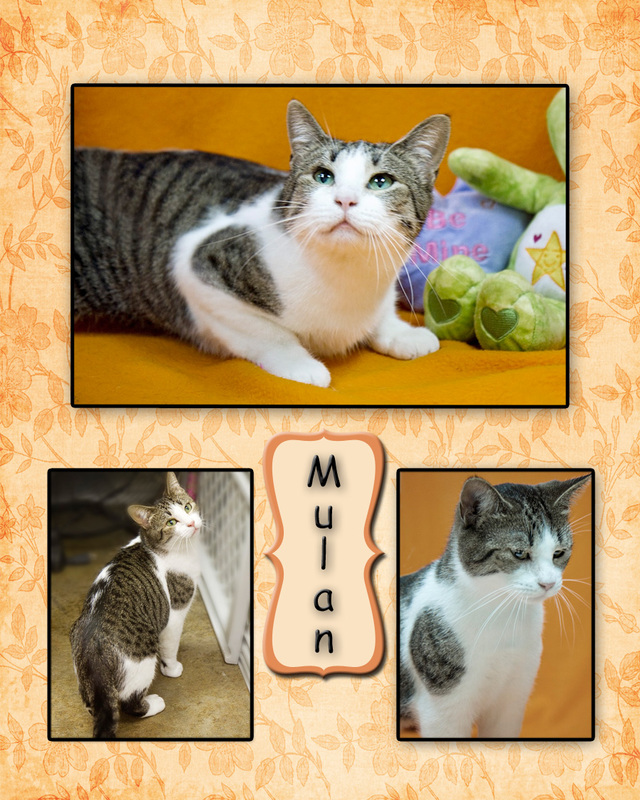 Mulan is a short-haired cat with an interesting pattern of black and tan tabby mixed with pure white. She is approximately 2 years old. In one picture she looks sleepy because I had to wake her up to take her picture. In another she is exploring and checking out the other cats. In the other picture she is posing (sort of) among some toys. Mulan is friendly and likes attention! I don't know why this wonderful girl has been at the shelter for well over a year. She would make a great pet! Please come visit her and see if you could give her a forever home! Presently available for adoption from the Humane Society of Noble County are these two boys - PJ and Fozzi. They are both up-to-date on vaccinations and are patiently awaiting their new homes. PJ is a medium-haired black and tan male tabby who is 2-3 years old. He has been at the shelter for only a couple of weeks. He is very friendly and affectionate and loves to be held and petted. As you can see from the pictures, he is also quite laid back. He just wanted to have his belly rubbed! Fozzi is a short-haired black and white male who is 1-2 years old. He is also front-declawed. Fozzi has been at the shelter since the end of April. He is friendly, but he just wanted to explore rather than pose for pictures, and he refused to look at the camera. The pictures do give you an idea of his pretty markings, however. These boys and the other animals at the shelter are waiting for your visit and the chance to find their forever homes! 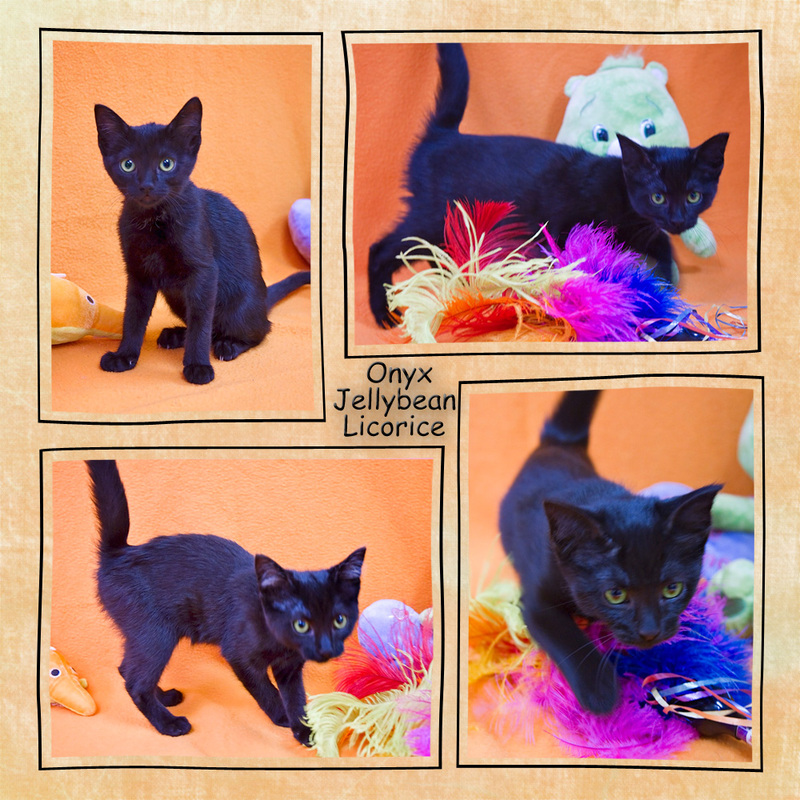 Meet Onyx, Jellybean, and Licorice, three siblings who are available for adoption from the Humane Society of Noble County. All three are black, with a few white hairs on their chests and tummies. Which is which, you might wonder? I don't have the slightest idea!! They are so identical that I couldn't tell them apart. I just know that I took pictures of 3 different kittens. These girls are 4-5 months old and have been at the shelter for less than a week. They are all friendly and like to be held and petted. They also like to explore - in fact, they were much more interested in that than in having their pictures taken! Please come to the shelter to visit them (and all the other great animals) and you just might fall in love! Some cats just like to explore, and these were two of them. They had no intention of sitting still on the little backdrop scene we had created for their portraits. They were climbing and checking out the other cats, and couldn't have cared less about getting their pictures taken. smile emoticon Both are available for adoption from the Humane Society of Noble County, and are up-to-date on vaccinations. Geordi is a long-haired male who is dark gray and white. He is 2-3 years old and has been at the shelter for about a week. He is also very friendly and loves petting and attention! Come visit these handsome boys and see if you could give them a forever home! 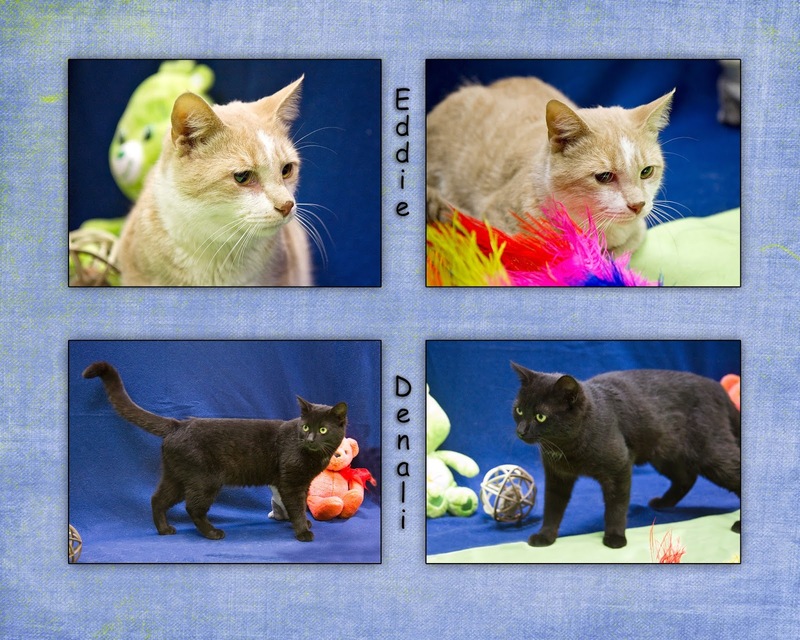 These two boys, Eddie and Denali, are available for adoption from the Humane Society of Noble County. They are both up-to-date on vaccinations. Eddie is a very good-looking short-haired buff and white male tabby. He is approximately 5-6 years old and has been at the shelter for just short of 2 weeks. He is friendly and affectionate and seems very calm and laid back. Denali is a short-haired black male with a few white hairs on his chest, which you can see in one of the pictures. And look at his big green eyes! He is around 2 years old and has been at the shelter for about 2 weeks. He is also very friendly. Come visit these boys and the other fantastic cats and dogs at the shelter who are waiting for their loving, forever homes! Just look at this handsome guy!! This is Darwin, and he is available for adoption from the Humane Society of Noble County. He is up-to-date on shots, worming, and flea prevention. Darwin is approximately 2-4 years old. He is a short-haired gray male with a white chest and belly and 4 white feet. He has been at the shelter since the last week of April. At first Darwin was a little shy, but he is very friendly and is warming up to attention and loving. As one of the pictures shows, he is also getting used to a wide variety of toys. He is a gorgeous cat with thick, soft fur and big green eyes. Come visit Darwin and the other great animals at the shelter who are all waiting for their forever homes! 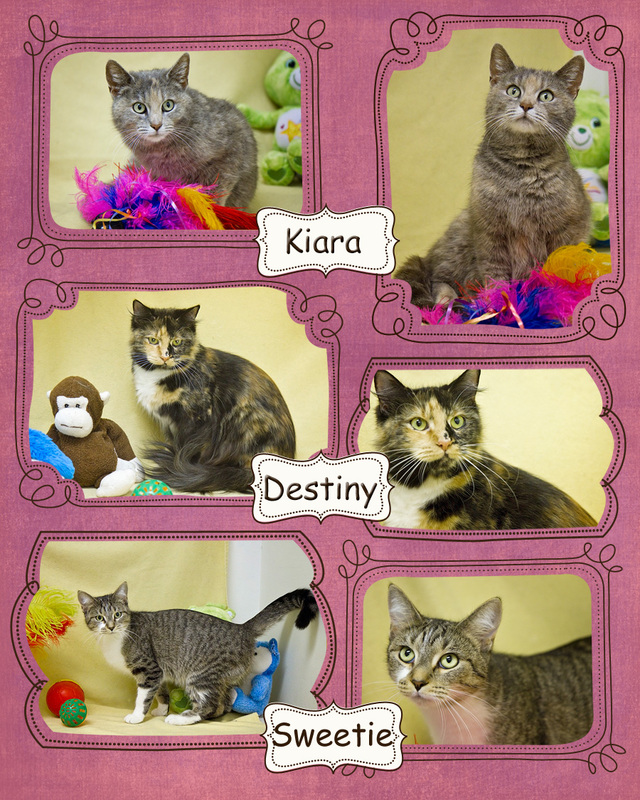 These three beauties are newcomers to the Humane Society of Noble County and are waiting for their forever homes. They are all up-to-date on vaccinations. Kiara is a short-haired gray female with a lot of peach and tan coloring. She is 2-4 years old and has been at the shelter since mid-April. She is a little shy, but wants to be friendly and seems like a very nice girl! Destiny is a medium-haired calico who is 3-4 years old and has only been at the shelter for about a week. She has extremely soft fur, which you can almost see in the picture. She is also a little shy, but friendly and loves attention! Sweetie is a short-haired black and tan tabby with a white chest and belly and 4 white feet. She is 1-2 years old and has been at the shelter for about a week. She is a very calm, loving, and sweet cat - thus her name! Please come to the shelter to visit all of the animals and see which one you want to go home with you! News about senior photos for 2014-15 school year.